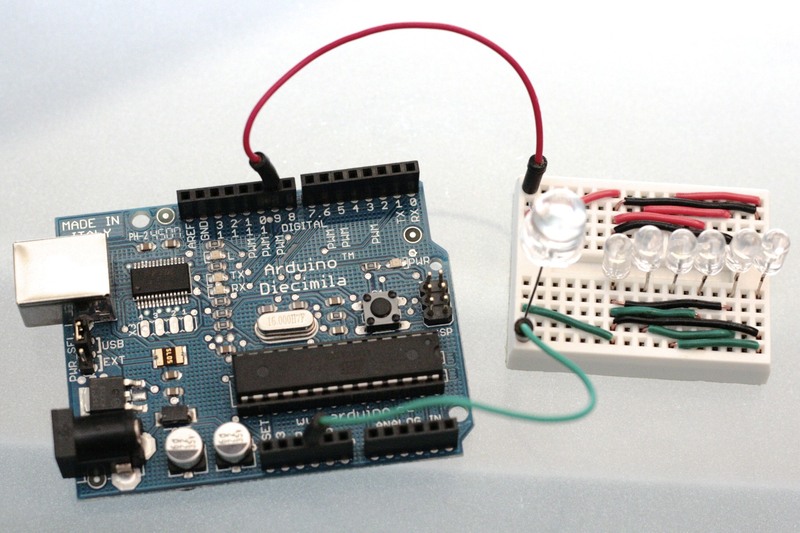 In part 1, we examined the architecture of the Arduino and AVR microcontroller. In part 2, we set up the AVR-GCC toolchain and avrdude. This time, we will look at some more project-specific hardware buildup for a gradual-wake light clock. This is meant to be at the “completely new to electronics design” level. If you know your way around parallel LEDs, you can probably build something better than I’ll build here. Our regular alarm clock is pretty jarring, and it doesn’t really solve the problem of the room still being dark. How about we solve both of those at once by gradually lighting up the room? Our little dream (or dream-interrupting) device. 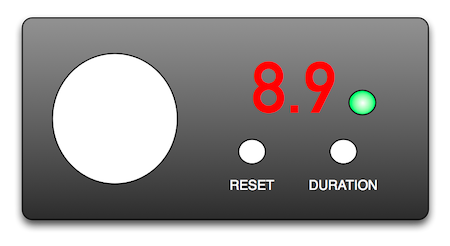 Timer – This will mostly be taken care of in software. Reset – turn it off. Duration – increase the duration until wake within a set range, at the top it will simply loop back to the lowest value. Holding the reset button and pressing the duration button will turn the alarm back on after it has been turned off. We’ll start with the simplest part first: making a bright light. We’ll use a tiny breadboard, but perhaps if I had more LEDs I could fill a half-size breadboard and outshine the surface of the sun. If you’ve never worked with them or are a bit rusty on the details of the various kinds of breadboards, have a look at the Wikipedia Article. 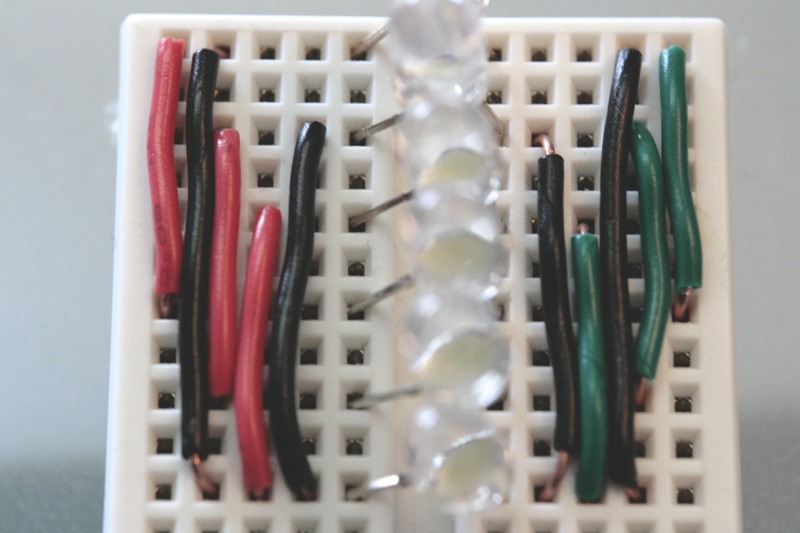 So, with a bunch of LEDs in one hand and the breadboard in the other, we want to know whether a series or parallel circuit will be the brightest. For reasons you can find out in second-semester college physics (or through empirical observation), the parallel configuration will give us the most light. Six LEDs connected in parallel to appropriate pins on the Arduino. This is a bit tough to describe in words, but luckily I have pictures instead! Insert LEDs such that the pins are inserted into the innermost (nearest the gap) points. IMPORTANT: make sure all of the anodes and cathodes are on the corresponding side of the gap. I skipped one row between each LED using 5mm dome LEDs. 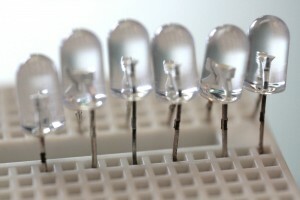 Pretty LEDs All In A Row. Notice the skipped rows. Pretty LEDs All In A Row, Part Deux: If you look closely at the inside of the LEDs, you can see the anode/cathode structure. Parallelize 3 sets of LEDs. You’ll need 3 jumpers of the same length. 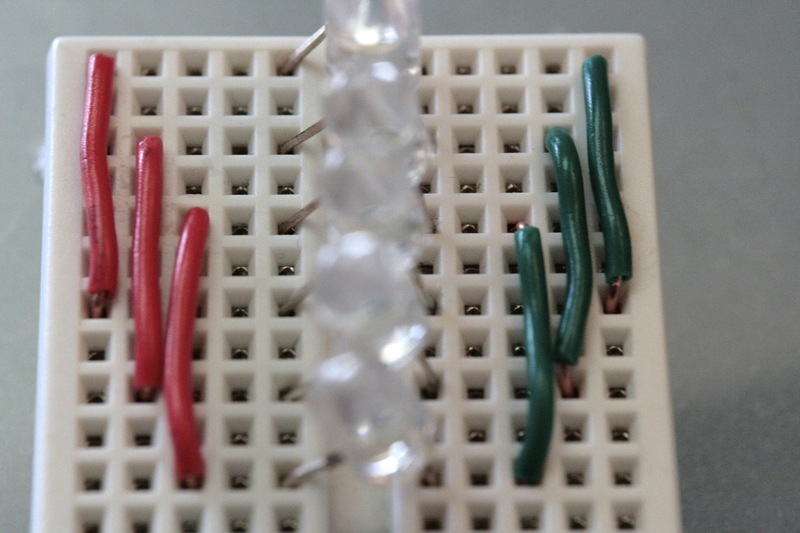 In my case, I chose to make them span 7 pins – the distance between 3 LED anodes/cathodes. 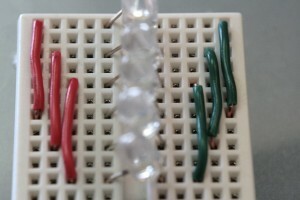 And of course, I chose red for the anodic side and green for the cathodic side. Top view. Parallel circuits for LEDs 1/4, 2/5, and 3/6 on the anode (left) and cathode (right) side. A different perspective on the progress so far. Connect each set back to a bus row. Basically, we need each pair to connect back to one row, where we will actually connect the power and ground. Since there are only 4 columns available on my tiny board, some overlap was necessary. I used black wire to indicate bus connection wires. Bus wires added. Not pretty, but it forms a logical bus. (optional) I chose to drag the bus down to the end of the board. The giant blur in the foreground is another larger white LED I had sitting around. Two wires pull the bus down to the last row. 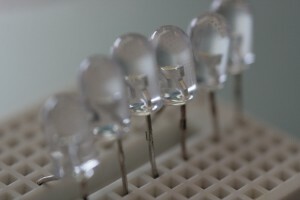 Out of focus: giant LED. Yay, we’re done building the light module! For our first run, we’ll actually try a failsafe way to test rather than loading up any software. 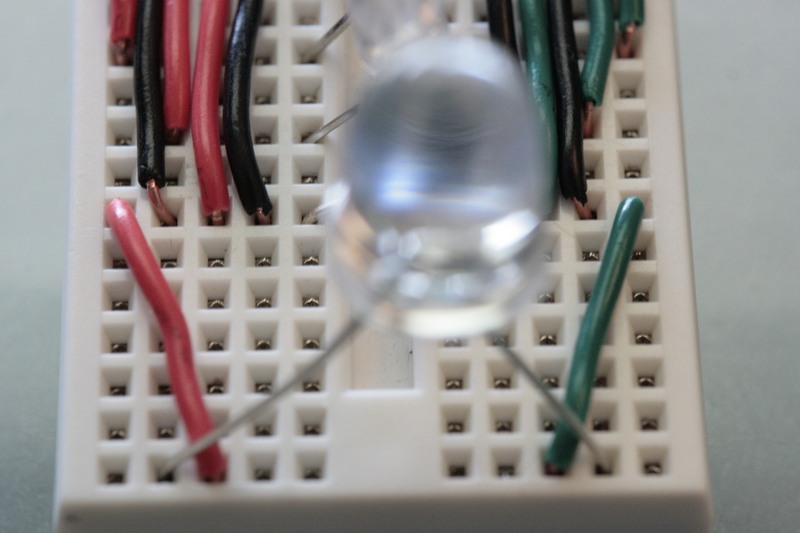 For our positive voltage, connect a jumper from the anodic (red) side bus row to the 3V3 pin towards the “bottom” of the Arduino. Connect a jumper from the cathodic (green) side bus row to one of the two nearby GND pins on the Arduino. 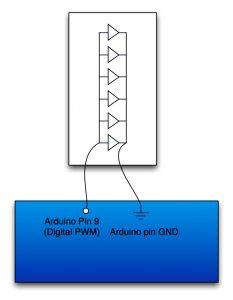 Now, connect the Arduino to its power source – probably USB. All of the lamps should glow brightly – if a single lamp is out, you probably have the anode and cathode reversed; switching its orientation on the breadboard should fix it. 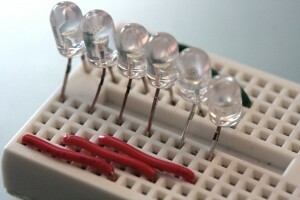 The 3V3 pin is meant as a reference voltage pin, so we probably don’t want to test its capacity by leaving the lights attached for too long – disconnect your power source first, then the light module. We want to be able to raise the light level of the light from nothing to bright over some amount of time. For now, we’ll just focus on fading from dark to bright. Select the Fading sketch from the Analog Examples (even though we're using digital trickery). 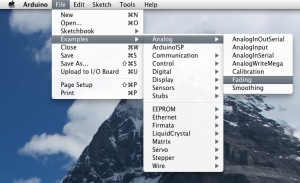 This will flash the Fading sketch to your Arduino. Once the RX and TX lights have stopped blinking and the software proclaims “Done uploading,” disconnect your Arduino from USB before we reattach the light module. Light module connected to Pin 9 and GND. You can connect the cathodic side your light module to a GND pin on the bottom of the Arduino, or choose the one to the left of digital pin 13. 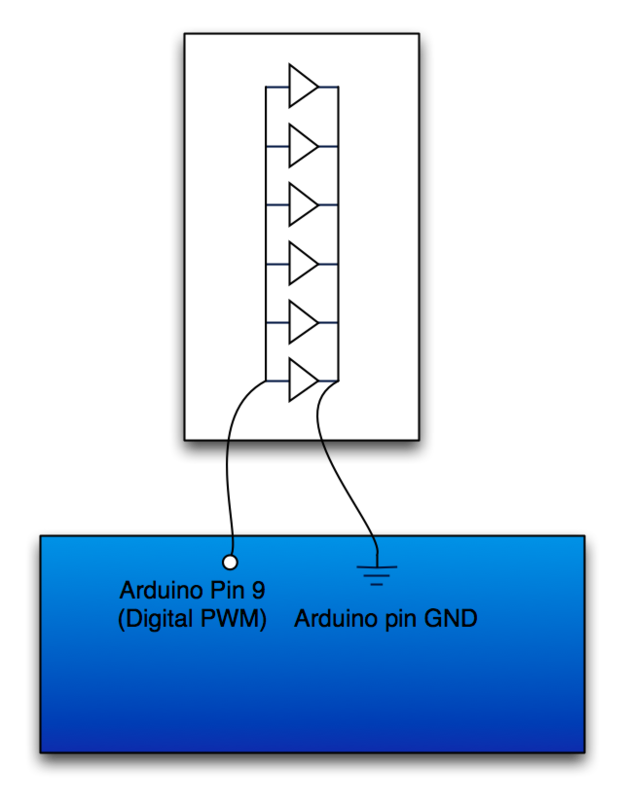 The anodic side should be connected to our voltage source – Digital PWM Pin 9. With both sides connected, you should now be able to reconnect your Arduino to a power source (USB) and see your many lights fading calmly. And now, an excuse to use the HTML5 <video> tag! Now that we have a light to light up, we need a way to show what duration remains before the “light alarm” goes off and whether or not the alarm is on. 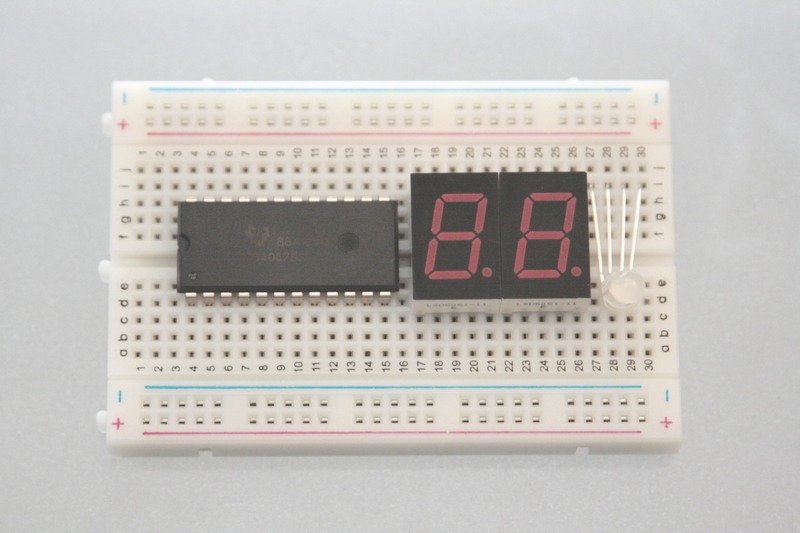 Our digit display is clearly going to be two seven-segment LED displays; I’m using ones I picked up from the UNL EE shop – part number LSD5051, common cathode. 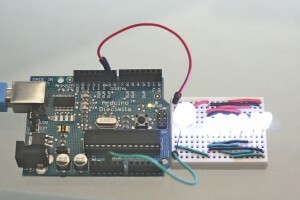 The status light I chose is a combo RGB LED similar to this one. Be sure to notice that the forward voltages are not symmetric: while blue and green can handle 3.2V, red can only handle 2.0V and will burn up in a hurry if you’re not careful. You may have noticed that there are a lot more pins coming off these display devices than we have left on our Arduino. 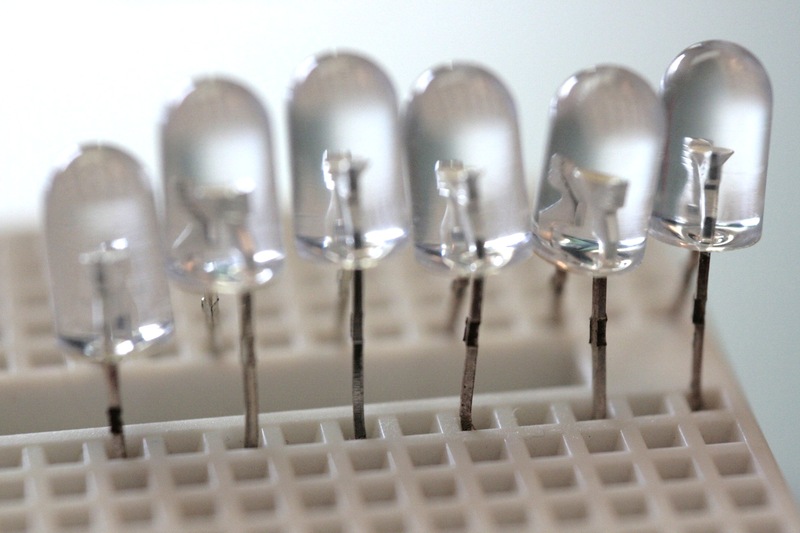 Because LEDs are not instant on-off devices (though they’re darn close on a human time scale), we can use persistence of vision to our advantage and drive many more pins through a device called a multiplexer. 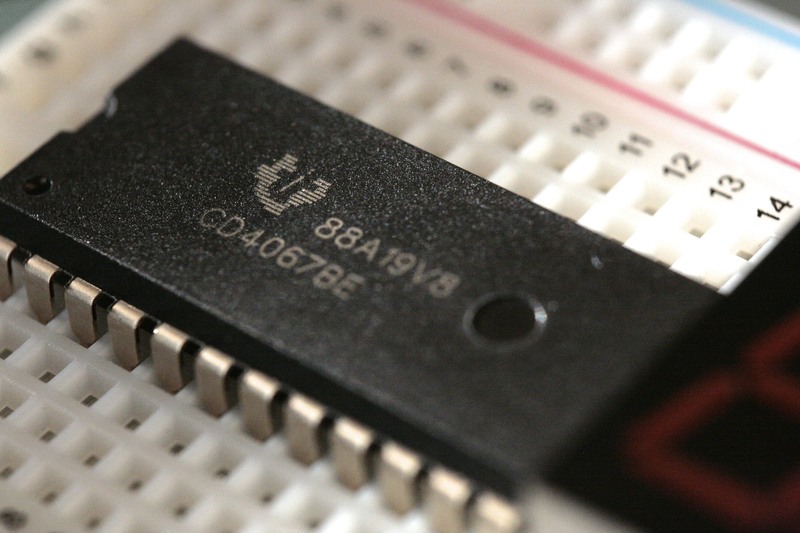 In particular, I’m using the TI CD4067BE. That part may be a bit hard to find, but fortunately, it’s available cheaply online. If you have to wait on it, you can check out its datasheet and get some idea of how it works. We’ll dive deeper into that next time. The beginnings of a display module. There will be wires, my friends.